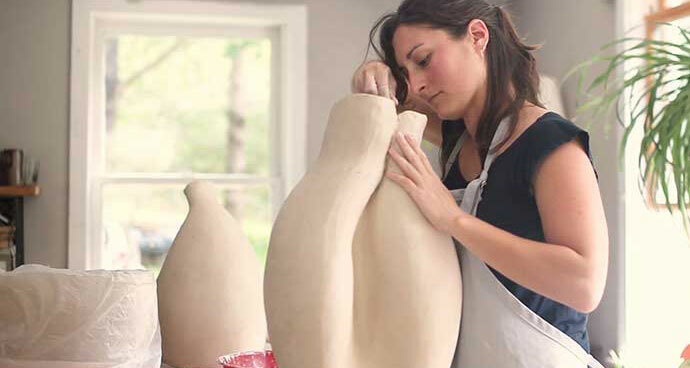 Ceramicist Kat Habib at work in her studio. The Project: Throughout 2017, Luke and I produced a half dozen five- to seven-minute video profiles of individual artists in Rappahannock County, Va., exploring the relationship between art and nature amid the county's scenic Blue Ridge foothills. The Client: These videos were underwritten in large part with a grant from the Rappahannock Association for Arts and Community, as part of RAAC's annual Claudia Mitchell Arts Fund program. Details: This year-long project was the start of my video adventures, and the beginning of the happy collaboration with Luke Christopher. Except for the video on the one anomaly in the group — jazz musician Bill Harris, the others all being visual artists — the video soundtracks were all my original music.